The Willamette River accounts for 15 percent of the Columbia River's flow. Its main stem is 187 miles - 301 km - in northwestern Oregon as it flows northward between the Oregon coast and Cascade ranges. The Willamette Valley basin that contains two-thirds of Oregon's population and is one of the most fertile agricultural regions in North America, hence the destination of many 19thcentury pioneers traveling on the Oregon Trail. The river supports 60 fish species, including salmon and trout. 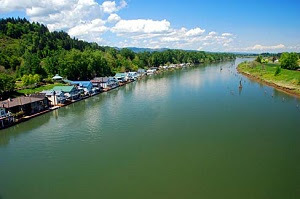 The Upper Tributaries of the Willamette originate in the mountains south and southeast of Eugene and meanders north to join the Columbia about 101 miles - 163 km - from the larger River's mouth on the Pacific Ocean. The channel is the main navigational channel for Portland's harbor and industrial areas. Watershed The Willamette River drains a region of 11,478 square miles - 29,730 km2 - 12 percent of the total area of Oregon. 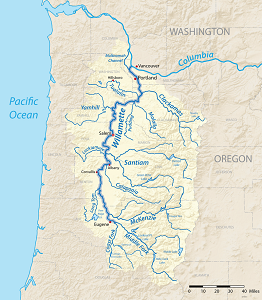 Watersheds bordering the Willamette basin include the Deschutes and Sandy Rivers. Sixty-four percent of the watershed is privately owned, while 36 percent is publicly owned. Recent History by the early 20th century, major river-control projects began to take place. 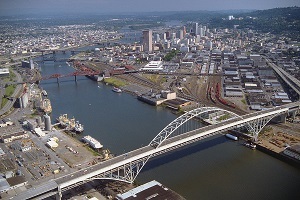 Levees were constructed along the river in most urban areas, and Portland built concrete walls to protect its downtown sector. 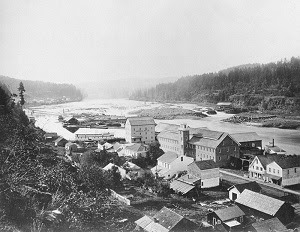 Decades later, many large dams were built on Cascade Range tributaries of the Willamette. The Army Corps of Engineers operates 13 such dams, which affect flows from about 40 percent of the basin. With development near the river came increased pollution. By the late 1930s, efforts to stem the pollution led to formation of a state sanitary board to oversee modest cleanup efforts. In the 1960s, Governor Tom McCall led a push for stronger pollution controls to enhance historical, natural, and recreational values along the river. The Willamette Greenway program has created a system of parks, trails, and wildlife refuges along the river leading to the 1998 appellation of American Heritage River.